Acne can be quite a headache. Even with the recent increase of using foundation or concealer to hide the spots among Kenyan ladies. You wear your best dress but you do not feel beautiful enough. You use expensive facial products but they seem to worsen the acne. The good news is you could clear acne slowly at the comfort of your home. Do not throw away the banana peel: Banana peels contain Lutein which reduces the discomfort of acne. Simply rub the peel on your face in a circular motion. Rinse off after 30 minutes. This will cost you only Ksh. 10 or less. 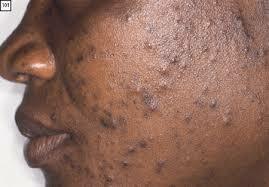 The power of Sodium bicarbonate (Baking Soda): It dries of excess oil and exfoliates your skin. Mix the baking soda and water into a thick paste then massage on your face. Leave on for 20 minutes then rinse with warm water. Use Pawpaw: Raw pawpaw removes dead skin cells and fats on the skin. It also contains papain which reduces inflammation of the skin. Rinse your face then mash up the pawpaw and apply on your skin. Leave it for 15-20 minutes and rinse off. Extra tip: Do NOT pop those pimples no matter how tempting it is.